There are 30 Assisted Living Facilities in the San Luis Obispo area, with 7 in San Luis Obispo and 23 nearby. The average cost of assisted living in San Luis Obispo is $3,725 per month. This is higher than the national median of $3,346. Cheaper nearby regions include Los Osos with an average starting cost of $3,500. To help you with your search, browse the 57 reviews below for assisted living facilities in San Luis Obispo. On average, consumers rate assisted living in San Luis Obispo 4.5 out of 5 stars. Better rated regions include Nipomo with an average rating of 5.0 out of 5 stars. Caring.com has helped thousands of families find high-quality senior care. To speak with one of our Family Advisors about assisted living options and costs in San Luis Obispo, call (855) 863-8283. Located on the Central Coast between Los Angeles and San Francisco, the city of San Luis Obispo has a population of 46,716. In San Luis Obispo, as in the rest of California, assisted living facilities are called residental care facilities for the elderly (RCF). There are seven RCFs in San Luis Obispo and 38 nearby. 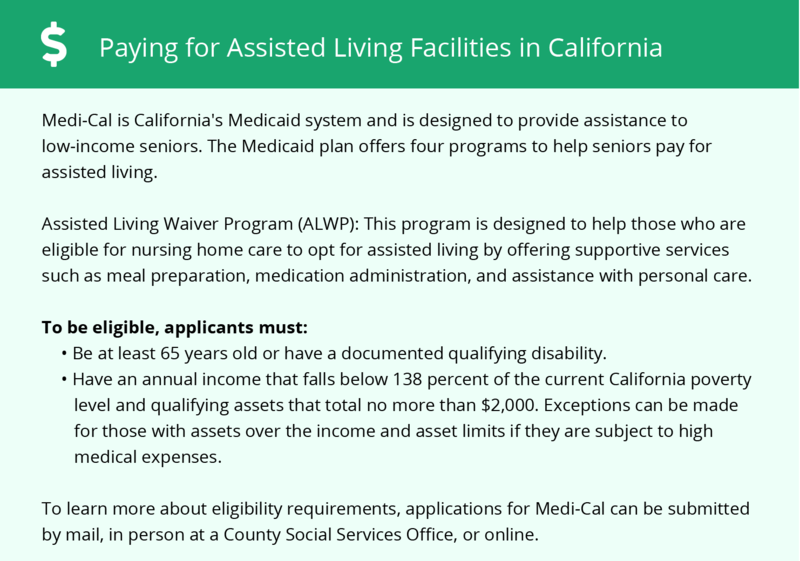 Each helps seniors with personal care and activities of daily living and is regulated and licensed by the California Department of Social Services, Community Care Licensing Division (CCLD). San Luis Obispo seniors should be cautious about going outdoors when there are unhealthy air quality levels reported by the Air Quality Index. This is common during fall and spring months. Due to the town's high particle pollution, it was ranked 13th worse in the nation by the American Lung Association (ALA). The cost of living in California is 52 percent higher than the national median, while the city of San Luis Obispo has an 83 percent higher one. This is inflated mainly due to housing costs, with other living expenses remaining relatively average. Seniors pay 2.8 percent less on health bills and 12.7 percent less on groceries than those in neighboring cities, which could help those on a limited income in California. San Luis Obispo is only considered safer than 4 percent of other communities in California. Seniors may want to consider the 27.75 percent higher violent crime rates compared to the national average before moving here if security is an issue. Seniors enjoy the relatively mild year-round weather in the San Luis Obispo area that allows for more outdoor activity than others in the nation. The hottest month, September, averages 65 degrees while the coldest month, December, averages 52 degrees. The San Luis Obispo area has an array of community resources for seniors, including the San Luis Obispo Senior Center, an organization that provides clubs, senior services and outdoor activities at the local senior center. Seniors enjoy the discounts on the abundant transportation options available in San Luis Obispo, including the Morro Bay Transit, Paso Express, SLO Transit, South County Transit (SCT) and Regional Transit Authority. Assisted Living costs in San Luis Obispo start around $3,725 per month on average, while the nationwide average cost of assisted living is $4,000 per month, according to the latest figures from Genworth’s Cost of Care Survey. It’s important to note that assisted living rates in San Luis Obispo and the surrounding suburbs can vary widely based on factors such as location, the level of care needed, apartment size and the types of amenities offered at each community. 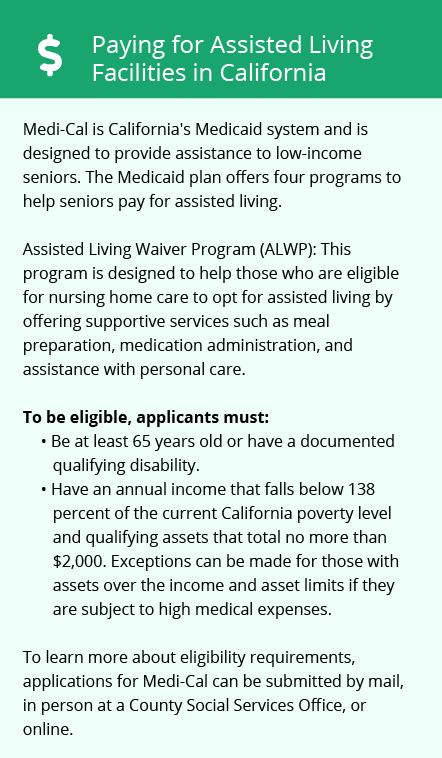 San Luis Obispo offers three financial aid options for eligible seniors including Supplemental Security Income (SSI), the optional state supplement (OSS) and Assisted Living Waiver (ALW). San Luis Obispo and the surrounding area are home to numerous government agencies and non-profit organizations offering help for seniors searching for or currently residing in an assisted living community. These organizations can also provide assistance in a number of other eldercare services such as geriatric care management, elder law advice, estate planning, finding home care and health and wellness programs. To see a list of free assisted living resources in San Luis Obispo, please visit our Assisted Living in California page. San Luis Obispo-area assisted living communities must adhere to the comprehensive set of state laws and regulations that all assisted living communities in California are required to follow. Visit our Assisted Living in California page for more information about these laws.